Jamba Anrebri is the daughter of Allegra Egerstau and Warkos Anrebri. 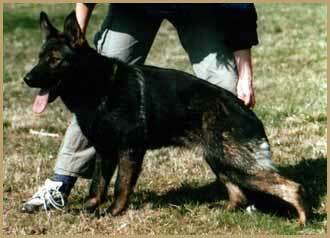 Allegra is one of the foundation females from the Anrebri Kennel, owned by Renata Angelovova. With owning Allegra and experiencing her excellence, I decided that owning Jamba would be an asset in the future of Czech German Shepherd breeding at Spartanville Shepherds. Jamba is extremely sound in temperament with strong nerves and exudes self confidence. Jamba is an extreme black sable German Shepherd, as her pictures show, with an expressive yet blocky head, strong bones and correct structure. She has exceptional working ability and exhibits equal prey and defense drives. Thank you Renata for this exceptional Czech German Shepherd female...she is a dream come true and one in a lifetime. I am deeply saddened as Jamba passed away in July, 2010. She was an exceptional female for which I have the utmost in love and respect. Jamba possesses all that her ancestors provided in the Eastern Block German Shepherd tradition and we expect her to pass these traits on through her German Shepherd puppies.